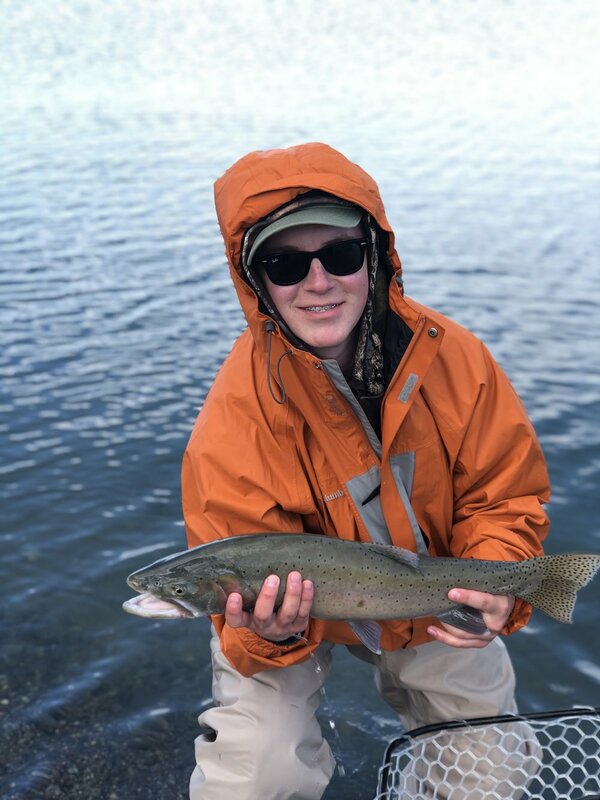 Fishing Reports — Pyramid Fly Co.
We are coming into another turn of the fishing season. As the air and water temperatures begin to warm will start to see fish cruising both feeding and non feeding post spawn fish. There’s still plenty of big fish being caught on a daily basis. When seeing cruising fish at your feet they aren’t always going to eat. Don’t get fish envy and just continue to fish for the ones out of sight past the cruisers then fish it in close. Also the fish are spreading out and beaches that aren’t too muddy have all been catching fish. Indicator fishing is still great this time of year giving the trout an easy meal without wasting a lot energy. Keeping flies in the strike zone is crucial. Midges and nymphs in red, black, and wine have all been catching. We can also now start to turn more towards balanced leeches as well especially in low light or larger wave conditions. The season is not over and the water is still cool for this time of year. If you haven’t got out this season you better come out soon while gettin’ is still good and the weather is nice ! Fishing this previous blue bird week was slightly slower than what is usually expected from March. As we began to enter more storm phases that the bite has definitely picked up to full swing. We are expecting more rain at pyramid and snow in higher elevations later in the week. The positive side of going through a spell of warm weather is it gave opportunity for the water to try and warm up. The water temps depending on the beach will be about 45-47 degrees. We are still waiting for the lake to obtain that prime 52-55 degree temps. We have only seen a few cruising fish but plenty of other fish feeding close to the shorelines. It’s becoming spawn season for summits and late pilots so prepare to see cruising fish in the next couple weeks! Some of the common beaches have been very crowded but for the exact reason of people are catching fish. Since we have had over a decade of the Pilot strain being reintroduced there is now such an outstanding number of fish in the lake and plenty of beaches to catch them at. Finding new water can be very rewarding and add some new excitement to old regiments. If you do choose to join the crowded beaches we all ask that you please use proper etiquette when fishing near other people. There’s plenty of room for everyone to have a great time and catch plenty of fish. Thank you! On the actual fishing side we have been doing very well using various midges and nymphs in red, wine, and black. With or without an indicator. We always get asked “what depth should we be fishing?” The answer to this all depends on what beach you are fishing. It could be 4ft it could be 18ft. Determining the depth of the beach quicker will help you decide the depth that’s needed to fish that particular spot. Play around with depths and you might be pleasantly surprised. Sinking lines are great way to determine depths on a sandy beach or to find an ledge farther out. Stripping sinking line has been tried and true and is never a bad go-to way of fishing any beach that won’t snag you up. Nothing beats time in the water and wet flies. Waiting for the different schools to come in or resident schools to circle back is the name of the game. The longer you wait the better your chance. Simple. We have had some incredible trips all with incredible people out here this season. The season isn’t over and there’s still plenty of time to make you’re trip! 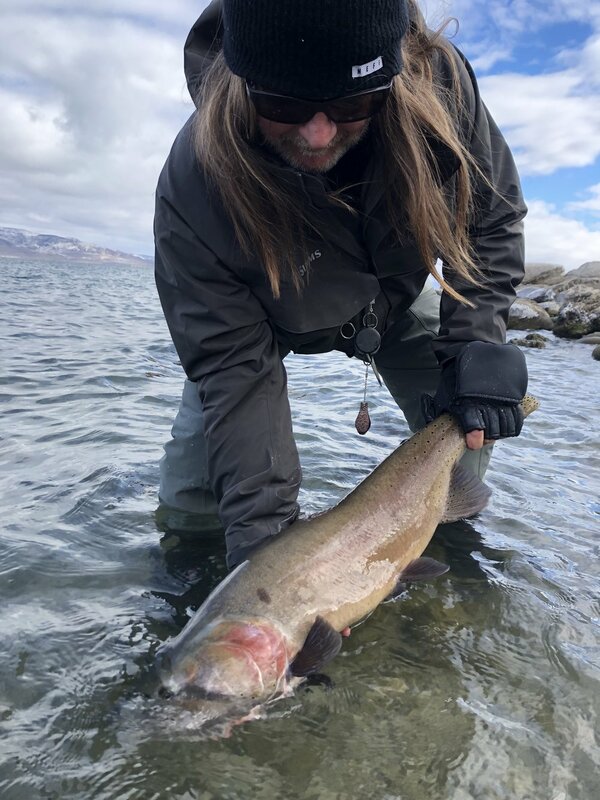 The PFC Team is ready to take you on your Pyramid Lake adventure, April is going to be fun with the Summit Spawn. Don’t miss out. As we swing into pre season here out at pyramid lake we can only imagine what is to come in the near future. There has been such a large increase in big fish being caught this year compared to the past. It’s so exciting and comforting to know these fish are continuing the thrive and the year classes continue to grow rapidly. Added to the mix is the summits coming in hot and heavy to keep you active with more grabs while you wait for “the one”. As the water warms both stripping, indicator and no cator style techniques will all produce fish. Depending on the beach will determine how it should be fished. It’s always a good idea to have multiple set ups handy to switch up through out the day or if one technique is doing better than another. Midges and nymphs in black, red, or wine as usual have been doing great and catching big fish. Stripping rigs with sink lines or shooting heads should try to always have a popcorn beetle or a boobie. Either by themselves or paired with streamer or bugger. This last week, John and Wes Knoll from Evergreen, Co fished with Pyramid Fly Co. guide Casey Anderson. These two anglers caught 12 fish over ten pounds along with 50 plus other fish in the 2-8 pound range. All these fish were caught on variations of midges under an indicator. It made for a memorable day and again goes to show how healthy the fishery really is becoming. PFC Client Wes Knoll from CO with one of the fat ones. This weekend Jamie Cragwall of Knoxville, Tennessee caught a monster cutthroat of a life time with Pyramid Fly Co guide Chris Nicola. The fish released itself before a weight was collected. This fish was caught on a black midge at Windless Beach. Client Steve Hammond from CO with PFC Casey Anderson doing it again. With all the weather we are having we have been off to a fantastic start to the prime period of the season come get a trophy while the gettin’ is good! Late February and going into March the “Summit” or “Pyramid Lake” strain will begin to start showing much more of a presence than previously. During this time both the Pilot Peak and Summit strain will simultaneously come into shallower water to begin to stage and start their spawn period. Now we will see more number than previously in the December and January periods. Many large, bright red summits are starting to show face. This is when the fish are prettiest looking by far with their colorful characteristics. The days soon to come will be the periods everyone has heard about as the “prime time”. With that comes the crowds. With so many fish in the lake this year many other spots that aren’t the normal popular areas are producing fish. It doesn’t hurt to leave the crowds and find new areas. Spots that may have more fish will still have more people, more flies, and more commotion in the water. Searching out areas with less pressure could be very beneficial and exciting compared to the normal routine. We are seeing so much great fishing weather you don’t have to be as selective on dates. There is more snow, rain and wind in the near future and we all know those days can bring the fish in. The lake level has come up slightly since our last big storm and should continue to do so. Always be careful coming over the I-80 pass or traveling in the snow or rain to the lake. Seeing more numbers of fish will allow us to play a little more with technique and fly selection. We are still catching a few more fish on indicators but there are plenty of beaches where stripping is still the go to. When you indicator fishing having many variations midges, nymphs, and balanced leeches. There have been quite a few days where they have been particular on bead color, hook size, etc. So make sure you stocked up and trying out different patterns. Reds, wines, and blacks are a good start. For leeches, blacks, white and olive are also great starting points. Stripping will still be the beetles and boobies and most color variations. Wooly buggers and Streamers in black, white and olive. Client Brian Swancutt made the trek from Maine to experience what Pyramid has to offer. Great Job Brian. Client Big Luke from Maine with his big cutty. 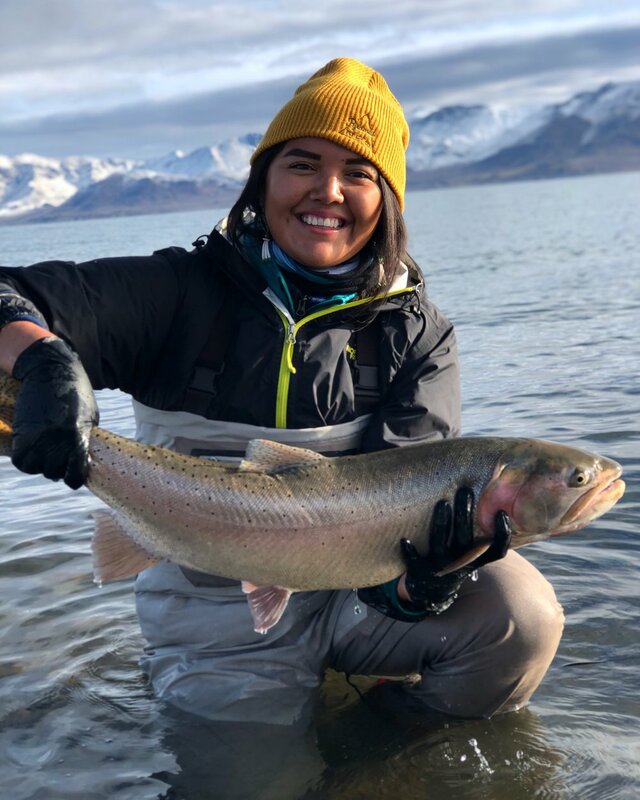 There’s still plenty of time to get out or plan the next trip out or book one of our guides here at Pyramid Fly Co. We love to see everyone on the water and be safe out there! With this incredible precipitation we have been receiving Pyramid has become one of the few places around the area that’s still fishable. So unless you’re stuck in the snow, the reasons to not fish the lake are dwindling. Pyramid has been fishing incredibly. Recently the rains have muddied up certain beaches. But where there is clear water there will be fish. Early mornings, afternoons and evenings have still been the best time for a good bite. Bigger schools will still move around all day coming in and out of the flats near the shores to feed. Being patient and keeping your flies in the strokes zone as long as possible is key for this time of year. You don’t want to miss your bites when then come. Any grab right now has the chance to end up being the trophy cutthroat you have been searching for. The trout hunt in packs and when it’s all going down you don’t want to miss it. If the fish are biting and people are catching keep your flies in the water. If a big fish is caught please be careful with handling, get photos, and release the fish quickly. There will be others around in the same area at that exact time. It’s not unlikely to see multiple fish over 10lbs come in a very short period when the schools are in. Keep an eye out for some proper fish handling clips on our social media outlets and website. Stay Comfortable! Layering up in this crazy weather we are having will be just as important than any bit of the actual fishing aspect. Within a 15 minute span it could be sunny, rainy, and snowy then sunny again. Real cold with wind and clouds then warm when the sun is out. Being comfortable allows you to spend more time fishing and less time warming up in the truck which in turn you will catch more fish. When it’s the time of year we are generally seeing more big fish than small fish being caught, it makes a big difference. Techniques and flies are back to the pyramid basics. Shooting heads and sink lines with a beetle or boobie. Pair that with a wooly bugger, streamer or any baitfish patterns. Still the colors that have seemed to work the best are olive, black and white. The indicator and “no cator” bites have been a bit more of the ticket for us. When the pods of fish are less frequent the indicator gives you more time in the strike zone. Balanced leeches and midges have been neck and neck in efficiency depending on the beach. Midges in red, wine and black. Balanced leeches in white, olive, and black have been solid. We can’t say it enough but time in the water will be crucial to catching these larger fish. With occasional large crowds on certain beaches and fish seeing flies more often make sure to change some patterns out, change size, color, weight etc until you find what they are keying in on. It could come down to as much as a bead color difference. With most of the rivers being blown out it’s time to hit the lake and we hope to see you out there. As we creep through February there has been no sign of the bite letting up. We have had and heard of great number days all over the lake. Many of those days including more than one or two fish over ten pounds. There has also been the very special days where we will see a dozen or more fish over 10 lbs in the net. This year has been fishing phenomenally. With the Pilot Peak strain in full swing we are seeing larger colored up fish that frequent the shallows. Mornings and late afternoons/evenings are still the best. When there is weather or low light conditions there has been a more consistent bite through the day. It’s been very cold and we are getting a decent amount of snow at times at lake level which is fairly rare If you can drive out safely it has really been worth the trip. Fish are feeding in the 5-12 foot range depending on the beach. Both indicator and stripping have been successful. Although we have been seeing a bit more grabs using midges and nymphs in shallower water. Here are some fly patterns that are going to be key to have in the box. For indicator set ups. Midges and nymphs in black, wine and red with variety of bead colors. Balanced leeches in olive, black and white. For stripping the always essential popcorn beetles and boobies in various colors. Wooly buggers and streamers 1-3” in olive, black and white. Being patient and waiting for the schools to come through is crucial. Stay warm and comfortable and try to put in the time. Then big fish are on chew and like we keep saying. The time is now! We are filling out dates fast but there is still plenty of time to book at trip! PFC President and Head Guide Casey Anderson proving once again that patience and paying attention pays off. Sometimes Mother Nature has her own ideas. Our Feb 10th Retrieving Clinic has been rescheduled to Feb 23rd. We have a few spots open so contact us, get signed up and come on out and learn the tips and tricks that will help you gain confidence with your new retrieving techniques. We are really starting to see bigger fish coming in at all periods of the day. Local anglers and alike have reported they have had a very good week with (4+) fish in the 19lb range caught, (26+) fish in the 10-15 lb range and a mix of the 3-7 lbers keeping anglers rods bent. Storms have been bringing more and more fish to the shore. Just look at Social Media, you’ll see that the quality of fish coming in is quite impressive and it’s not just the locals hanging big fish. Guided trips and Do it Yourself anglers have had good success rates. The fish have been very active especially when there are clouds or chop on the surface. Which is great news for the very near future as it's a very steady uphill climb. Fish are still being caught from North to South. Pick your spot and have confidence. We say this every week, don't miss your bites. Pay attention, If it looks or feels like a take set the hook. As Don Iovino always says "Swings are free". Don't be on your phone and don't be day dreaming. The fish know when your not looking. You think we are kidding ? We have seen it happen time and time again. Be on your A game, not your phone. Mario Guel and the TACO FLY CO Crew catching fish and having fun. Isn’t that what it’s all about ? Morning and Evening bites have been fairly consistent everywhere. Blockhouse, Sandhole, Windless Bay, Warrior, Indian Head, Popcorn and Pelican are all safe bets to fish. The flies you will want to have in your arsenal include: popcorn beetles and boobies in white, black, chartreuse, red/pink and combos of those colors.The trailing fly has been less specific as all bait fish streamers, clousers, wooly buggers and wooly worms etc. all have been doing very well. Again in the same colors as the beetles and boobies but use opposite colors when using the pair for higher contrast between flies. Floating line with and without an indicator has been producing it’s fair share of lunkers. Midges and nymphs have been working just as well as balanced leeches for us. Successful colors for anything hanging is black, olive, grey and red/wine. We recommend using gold, copper and white tungsten beads on your midges. With tungsten being heavier then brass your flies will hang more vertical and stay in the zone. Don't be afraid to vary depths or retrieve speed as well. 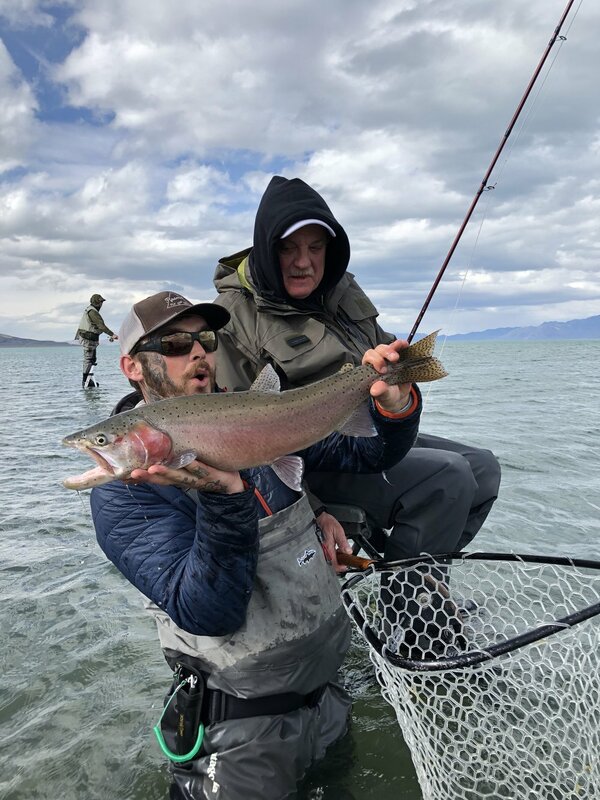 There are big fish lurking and putting your time in through next month will be one of your best times to catch your personal best cutthroat. This time of year can be cold so be sure to bring layers. Extra sets of socks and other warm clothes are always handy. It’s worth baring the weather for the fish of a lifetime. This January has fished incredibly better than last year paving the way for a great spring. Trevon Jester from San Diego CA still hasn’t stopped smiling. Mission Accomplished !!!! We have 2 spots remaining for our Feb 10th Retrieving Clinic with Casey Anderson and Morgan Kane. If you want to dial in this technique and gain confidence, contact us and get your spot. We have 3 storm systems coming in this week and if you want your chance at a trophy I would get to the lake. Our Pyramid Fly Co Team has some available dates, give us a call and lets get you on the water. Can’t catch em on the couch. Casey Anderson and the Pyramid Fly Co Team. Now is the time. The pilot peak strain are in full swing ready for their spawn period. Dozens of trophy fish are being caught each day. This time of year the large fish will frequent the shallows feeding on midges, nymphs and tui chubs in the flats. The bright coloration distinguishes the pre spawn and spawning cutthroat. Beautiful reds, oranges and golds can be seen on these fish. With the year classes going up it’s more and more common to see fish in the 8-12 pound range. We have had numerous days this year with 5-12 or more fish over the 10 pound mark. If there was ever a time to make a trip for the “big fish hunters” you should of been out already. But you’re not too late it’s only getting better. It’s safe to say this year has surpassed prior years on the amount of quality fish being caught. And again, it just keeps getting better. We have been dialing in flies and techniques to target these large fish and we would love to share or knowledge with you. We still have open days for guide trips and clinics but they are filling fast. Now for some tactics. With the cold water we have been sizing down and slowing down the action of flies. Just because the fish don’t want to use as much energy through the day doesn’t mean they won’t put up a fight in the cold weather. These fish are fired up right now and willing to give you a real battle. Don’t come under gunned. 7 and 8wt rods should be used fighting these fish whether it’s sinking or floating line. We have been seeing a few more fish come on indicator rather than the strip. Both will catch but the fact that fishing an indicator will leave you in the strike zone longer is a big key in winter. When a school of large fish come in it could be quick but well worth the wait. PFC Guide Morgan Kane tested out a new midge pattern. I’d say it worked. Midges and nymphs in red, wine or black with other variations are working great. Balanced leeches and baitfish in white, olive and black are also great color choices. The depth will vary per beach so play around until desired depth is found. Stripping will be popcorn beetles or boobies paired with buggers, or streamers. Changing cadence until the proper speed is found. If you have thought about coming out, now’s the time to pull the trigger. Getting right down to the facts is this season has been the best we’ve ever seen for trophy sized cutthroat. Quite honestly there are more big fish being caught currently than possibly ever before, literally almost everyday at the lake trophy is caught. Years prior we were seeing the predominant amount of large pilots being caught in spring roughly around March, last year a the big push was February and March. Now it’s already happening in January. Not to say January hasn’t almost brought in some bigs in past seasons but this year in particular has been a heater. Still not the crazy numbers game yet but the bites are generally bigger. It’s easier said than done when the fishing is slower to pay more attention but it will be a key to success. Because the bites that do come will really matter, so don’t miss them. Stripping is still getting fish but the success for us has switched a bit more to the indicator. On cold or sunny days where the shallows haven’t had to much time to warm up the fish will be a bit more lethargic on feeding patterns. So staying in the strike zone longer and making an easy meal is another crucial key. But when hooked don’t let them fool you right off the bat. We have had a lot of red hot fish recently and it’s been a blast. Depths will vary around the lake so be sure play around with it. The go-to Midges, nymphs and balanced leeches have been all getting eaten. Midges and nymphs in red, wine, and black have been the top producers. Balanced leeches in olive, black or white have also been sticking a few nice fish. Stripping the usual boobies and popcorn beetles with other streamers or wooly worms will always get some fish interested, the speed of retrieve will play a big factor in success so vary it up until you found what they prefer that particular day. With pushes of big fish come in now is the time you want to start planning your next trip. 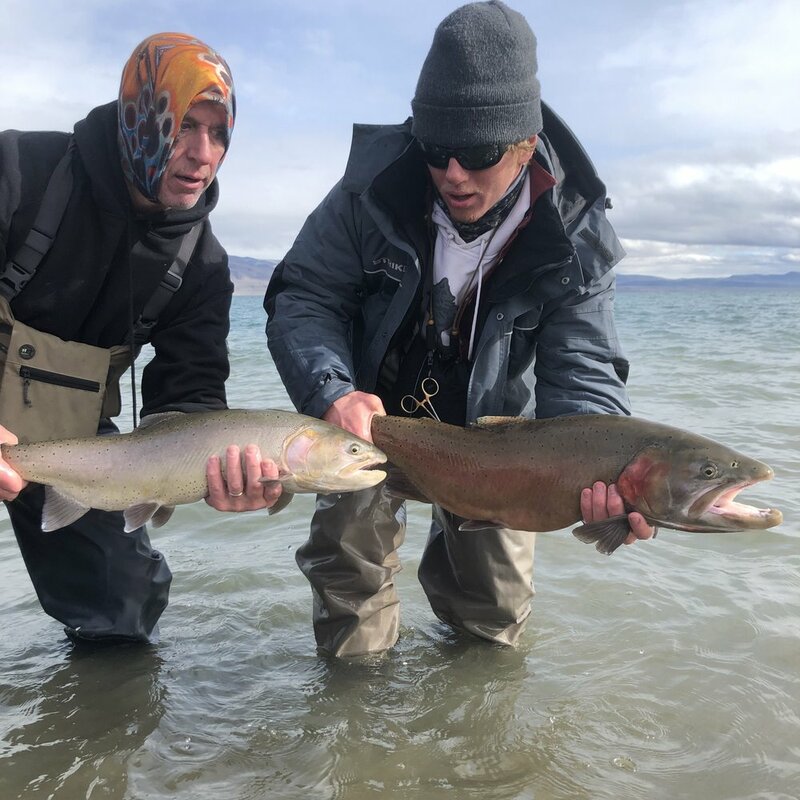 With multiple guides we can accelerate the learning curve and better your chances of connecting with one of these monster cutthroat. New for February are our 2-day clinics covering both indicator/switch rod one day and stripping/retrieving the next. 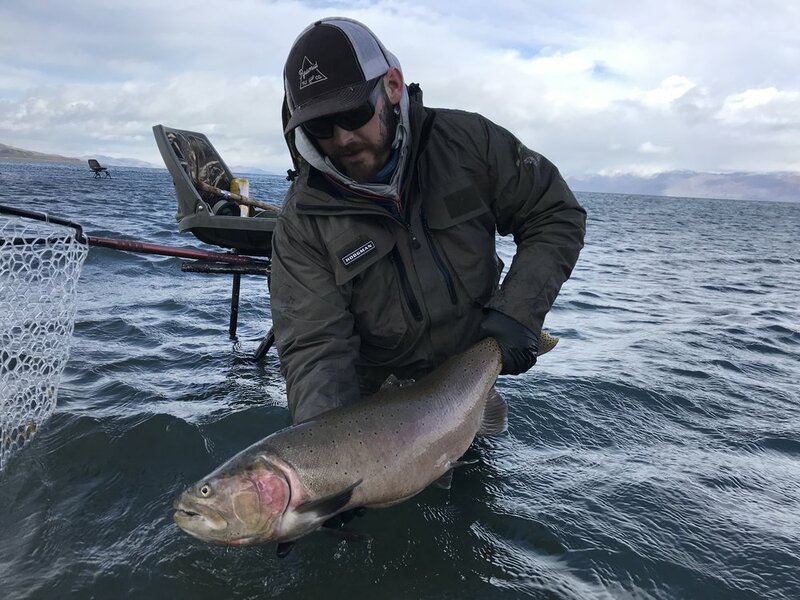 As we slide into the cooler months of the season we typically see fewer fish per day but our odds at one of those fish being a monster is far greater than the other months out of the season. It hasn't been a numbers game the past few weeks but we have been tangling with some seriously impressive trout. This is a favorite time of year for the die hard trophy trout hunters. Less angler pressure because of the colder weather and some of the largest of the year are caught around this time. #pfcbigfishcontest angler Joseph Deleon @hunter_jo took advantage of the colder temps. We have found that the fish have been keying in on midges and nypmhs a bit more recently than the bait fish we have been previously seeing them focus on the majority of the earlier season. Getting your flies in the strike zone and knowing the depth of the beach are you are fishing is key. These ledges have changed with currents and the rise and fall of the lake levels so don't assume everything is still the same. colder surface temps will make cruising and feeding fish more lethargic so being patient will be key. Not to say stripping hasn’t been effective recently. It tried and true for large fish but with them being more lethargic sizing down flies or slowing retrieve can be effective when times are getting tough. Don’t be afraid to have both rigs ready and occasionally switch back and forth, but not too often to where we are wasting precious fishing time. Put your time in to be successful this time of year. Don't just pack up and go home because the fish haven't rolled in yet. And when you think it's slow and pull your phone out of your pocket, take a drink of that soda, dig into your pocket for that snack or look away for a brief moment that bobber will vanish in no time. So when you turn back around and look for it....don't think, set that hook! Wanting to better your chance at a fish of a lifetime? Having multiple guides we can accommodate almost everything from single anglers on a time crunch to large group all inclusive packages. We would love to share our knowledge of this amazing fishery with you and share the sound of a screaming drag. We are getting colder as we advance through December. Air temps are consistently reaching below freezing most every night. We just exited an extended inversion layer keeping the cold air compressed at lake elevation. Good news is there is slight incline in air temperature this coming week. This colder water in the shallows have made fish slightly lethargic but they are still very hungry. We are seeing significantly higher number days through December this year than we did last season around this time. The morning bite has been worth waking up and fighting the colder morning temps. As the shallows warm up schools will come in and out of casting distance. We are seeing the larger fish still come between 10 am and 3pm during the day when it’s the warmest. It’s gamble on when they will come in during this, but when they do it’s time for them to feed. The magic hour might be short lived but well worth the bite. Big fish are still being caught and released almost everyday through out the lake. So it’s time to go out and get yourself a “PB”! As we previously discussed the colder water temps will make the fish more lethargic. They are always feeding but will spend less energy trying to eat. So giving fish easy meals to target will be key during winter months. The bite is now leaning more towards the indicator bite rather than the strip for numbers. Although less grabs as of the last week we are still seeing our larger fish this year come from the strip. Stripping bait fish/tui chub patterns paired with a boobie and beetle is always a solid go to. The ol’ faithful combo has brought in A LOT of 10+ lbs fish this season so far this season. Streamers and buggers in olive, black and white have all put out. Pairing with a popcorn beetle or boobie in really most color patterns are great starting points. Indicator bite has been putting fish in the net more consistently with colder water temps. Hanging two midges or midge/balanced leech under a bobber will allow you to frequent the strike zone and crushing lanes longer than stripping. Midge patterns in red, wine and black have been great. The balanced leeches in olive, black and white have been a real staple this last week. Even though it’s cold it’s still very much worth it to make a trip out to the lake. Pyramid Fly Co. has 3 guides this season so we can always accommodate guided trips, from singles to large groups. Come get yourself a fish of a lifetime! Finally, the winter storms have began to roll in. These conditions have really brought plenty of hungry fish to the shore. We keep saying if you are chasing large trout this is the time to do it. We have surprisingly had some very good days on blue bird or partly cloudy days with minimal wind. It’s just a matter of time in the water. Schools of big fish have been coming at random times through out the day. With the water being cold sometimes it takes most of the day to warm up shallow water enough for the bigs to come in and comfortably feed. The best times seems early morning and between 10:30 am - 3 pm. But again, that is weather dependent. Another thing to remember is don’t leave fish to find fish. If you are getting fish to eat but haven’t found a big one, keep working it until the right fish comes by. PFC President Casey Anderson took advantage of his day off and the big fish bite. As the water continues to cool down the fish will begin to get slightly more lethargic. Slowing down how you fish could produce a few more fish as we get into winter. Fishing a floating line with or without an indicator with midges, balanced leaches or both have been effective of the ledges. Stripping has brought in more of our large fish this year. Vary retrieves depending on water and light conditions. Also, don’t be afraid to slow the speed of strip down either mixed in with of speeds and lengths per strip. PFC’s Casey Anderson rewarded again on his day off. Top colors for the midges are still red, black and wine. And as always the best colors for balanced leeches/baitfish and any other meat you might want to throw behind a sink line would be black, white, olive, and chartreuse. Now go out and get yourself a monster! Don’t forget about our #pfcbigfishcontest on Instagram running until January 1st! Grand prize is over $1,500 retail in products. Including Hardy - fly rod, Smith - Guide’s choice glasses, Hodgman - waders and inserts plus much more apparel, tools, and flies! Big fish season is upon us! This last week and a half has been fantastic for big fish from shore. 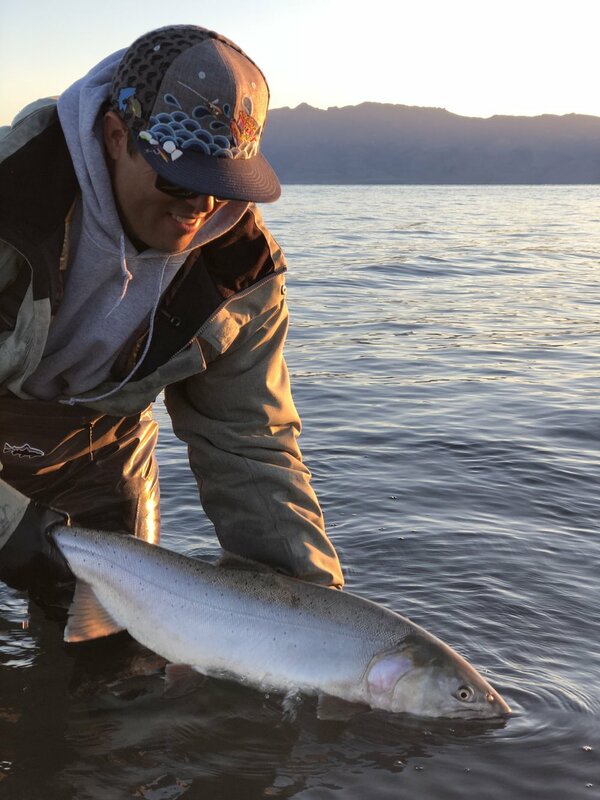 Cutthroat over 10 lbs are being caught everyday on different beaches on the lake from end to end. If you would like to get yourself a big fish you should start planning your next trip. There is never a guarantee and the number game isn’t like it is in spring. But, the average weight of fish is larger. 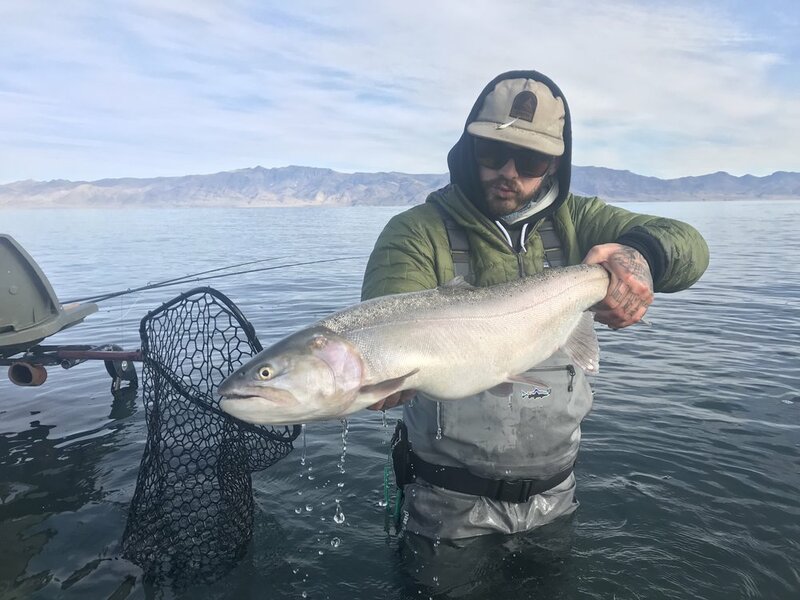 Which goes to show the health of the fishery and how well the pyramid lake fisheries department is taking care of the population. Year classes are going up so the “average” fish from just a few years ago are now 7 to 10 pounds and up. The 6-8 pound class range is becoming ever more common and well, the big ones just got bigger. The surface temps have cooled down quickly to a comfortable temperature for the larger trout. The morning and evening bite have been switching off on which one produces more. Schools will frequent the shallows more often in low visibility situations (i.e. dawn, dusk, windy and cloudy days). When the sun is high with no clouds to help cut the light down the fish will move farther out and come to feed in the shallows less. Finding a deeper drop off or ledge will help you stay more consistent through tougher times. Techniques and flies are back to the pyramid basics. Shooting heads and sink lines with a beetle or boobie. Pair that with a wooly bugger, streamer or any baitfish patterns. These have been more of the go to as of lately. Colors the have seemed to work the best are olive, black and white. The indicator and “no cator” bites have been great as well. When the pods of fish are less frequent the indicator gives you more time in the strike zone. Balanced leeches and midges have been neck and neck in efficiency. Midges in red, wine and black. Balanced leeches in white, olive, and black have been solid producers. Time in the water will be crucial to catching a larger fish. The larger trout have been caught at all different hours of the day from sun up to sun down, and it’s anyone’s guess when they decide to come into feed. Soon to be announced!! 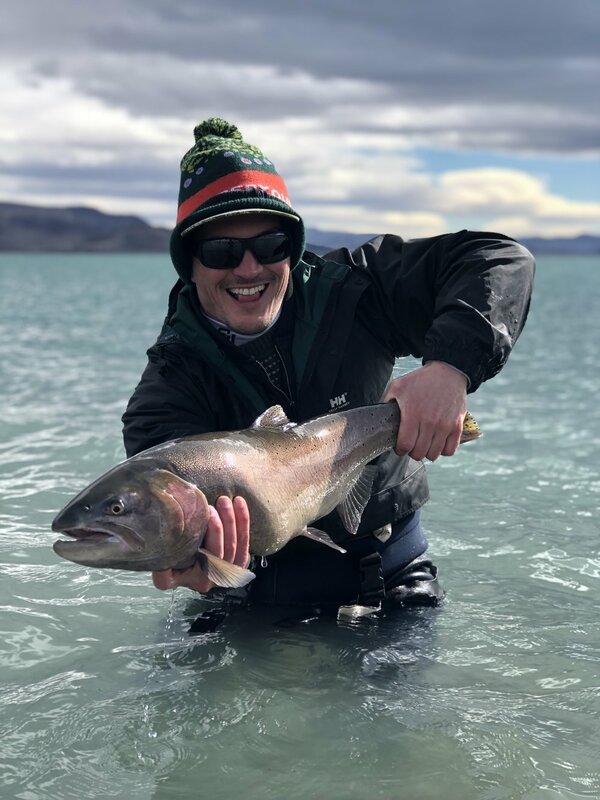 To try and add some extra excitement to big fish season Pyramid Fly Co. and our generous supporters will be holding a “Big Fish Photo Contest”. A catch and release contest on Instagram, free and easy. Again thank you to our supporters for donating over $2,000 in prizes. Visit our contact/partner tab to find out all the info! We hope everyone can participate and again it’s free admission! As we roll into November the overnight lows will increase the the number of fish coming into the shallows. Mornings will be your best bet for the next few weeks on the calmer days. Wind or clouds will make the bite more consistent through out the day. Due to the surface temperature dropping to 57-58 over night then up to 60 during the day, the lake is beginning to turn over. As of now it’s not thick and the fish are still moving around in it. Wind and current will shift the clumps around so you might have to drive around to find a clearing if/when it gets worse. There will always be clear areas, you just have to search for them. In the early mornings the strip bite and the indicator bite are about 50/50. Beaches that have quicker access to deep water or steeper drops will hold a few more fish. Stripping beetles or boobies with buggers or streamers in white, black, and olive have been the most productive. Indicator fishing with a balanced leech (again, in black, white, or olive, below a midge or nymph off the ledge has made for successful days as well. Both techniques will continue to produce as the surface temps drop and more fish begin to come into the shallows. We have had so many great trips in October it will be dearly missed but we are ready to see some more good fish from shore again! As we have discussed in reports of prior seasons, think of the digestive system of trout. It’s much easier to eat digest and gather nutrients from larger amounts of smaller baitfish than eating one large one. Digesting large fish takes much longer, having to dissolve large bones, fins and cartilage uses up more energy and time. Nobody wants to run a marathon after eating a whole pizza. Sizing down our flies has brought us great success recently. Natural baitfish patterns in colors such as white, black, olive and brown have all been successful. Heavy flies and/or heavy sinking line with a little patience will get you to desired depths. The fish are still suspended in deep water at certain times and love to chase a fast strip. Have anytime of watercraft is going to be an extremely helpful tool until the fish begin to come into shallow water. It a great time to get out and we edge anyone who can to get out and experience a different type of fishing compared to the normal shore fishing while this still lasts. An excellent quote from our guest Brian Brussels on today 10/22. He couldn’t of said anything better to describe his day. “let me get a drink of water and rest my arm. I'm tired already." -10:19am. We hope we can share this experience with you and can’t wait to see you all on the water. The 2018/19 season opener has been nothing but spectacular. Thus far only a couple windy days with scattered showers but for the most part Mother Nature has taken it easy on us. There is bait everywhere. Along almost every beach at the shore and spread across the lake. Easy to see and fun to watch these tightly packed bait balls are always on the run. Darting from trout and predatory birds they live a rough life. The trout on the other hand are not frequenting shallow waters as much. The mornings and evenings are best from shore. The quicker the beach drops to deep water the better. Schools come and go into shallow water chasing bait and that’s when the game is on. If you catch or hook into a fish you can bet there are more with it. As of now most LCT (Lahontan Cutthroat Trout) are in the 45’-70’. Don’t let this number discourage you. The schools travel frequently and come and go at many different depths through the water column. Pontoons, Float tubes, belly boats and most other stable water craft are really the way to go this time of year. The fish aren’t far off shore, but currently, most of the time outside of casting distance. But once out one your personal water craft the game is on. The numbers and size are fantastic. The LCT are fat, happy, and ready to show you what your backing looks like. They are fighting hard as ever and are looking for meat. Stripping has definitely been the successor regarding techniques. Heavy flies with fast sinking line as been an excellent go to per usual. Fast and erratic strips this time of year will get more grabs than a slow and methodical retrieve. Long leaders, floating line and heavy flies have brought some big fish to the net so far this season. Sharp strips and longer pauses create a jigging type motion. Streamer colors that have been successful thus far are, white, olive, grey and black. And of course combos of those colors as well. On opening day guides Casey Anderson and Morgan Kane landed six fish over the 10 lbs mark. And as the days proceeded many more have come. There is no other time of year like it. If you are on the hunt for your fish trophy, now is your time. Our guided days are beginning to fill up but there are spots available and we would love to see you out on the water. Surface temps are still in the mid 60s and perfect to anchor up the float tube, relax, and try your luck at the fish of a lifetime. As the excitement builds for the beginning of the 2018/19 season. We all eagerly count down the days until one of the most exciting and unique stillwater phenomenons. After the spring spawn millions of juvenile and adolescent Tui-chub school up towards the shallows. Soaking up the warm water and feeding on zoo plankton and other small insects. Fattening up before dropping to extreme depths during the winter. Large numbers of tui-chub creating tightly packed “baitballs” are generally seen as dark masses under the surface this time of year. The cutthroat can’t resist these baitfish buffets. Similar to schools of baitfish getting harassed in the ocean the birds and cutthroat of pyramid cant leave the Tui chub alone. Aggressively attacking the chubs, trout can easily put on some serious weight following the schools. This makes it the best time of year to throw streamers, balanced leeches, popcorn beetles, and boobies. If you are fan of stripping meaty flies now is your time. Baitfish patterns in colors such as white, olive, black, grey, chartreuse, and combinations of those will be great reliable starting color choices. From floating flies, (i.e. boobies, beetles, etc) to heavy weighted jigs, and everything in between should be in the arsenal. Depending on weather and water temperature the bait balls could be ranging from right under surface to the 50-100+ft. So having variations in weighted flies and fly lines will help you adapt to where the Tui-chub are in the water column. Stripping will be your best bet this time of year. Heavy sinking lines and shooting heads will help you get to needed depths. Having a heavier indicator rig will always be handy and a good second weapon of choice especially if the baitballs are close to the shore. Balanced leeches imitating the tui-chubs can be successful under indicators when baitballs are 20 feet and higher in the water column. Weather this time of year can make or break how the fishing is and surface activity of both Tui chub and the cutthroat. Warm calm days are best for sight fishing, surface activity, finding and following where the baitballs. The warm sunny days keep the chubs feeding towards the surface. Unlike most of the year when wind and clouds are needed, colder surface temps will push the baitballs to lower depths. Float tubes, belly boats and other small watercraft are also great ways to have success when the trout are concentrated deeper off shore. If you do choose to take a water craft of any sort on the lake be conscious of weather and wind. Gusts and high wind can appear instantly. So please be safe and follow all regulations while on the water. We can’t wait to see everyone out on the water and to start seeing more massive cutthroat through the season. Party on and tight lines! With the official season ending at Pyramid Lake, we can’t thank everyone enough for such an amazing and eventful year! The focus has shifted. Now its really time to start looking at our other fishing options in the area! Historically, by the second week of June the rivers of the Eastern Sierra have hit peak run-off and are starting to drop. And just like clock work, that’s what we are seeing. Rivers like the Truckee will continue to stabilize with controlled releases from tributary streams along the main stem. The East Carson river, a little further south, is a true freestone and has very few dam controlled tributaries resulting in what I like to call a “yo-yo” in flows throughout the day. The water will rise and fall during the day as snow melt ebbs and flows with the changing temperatures. The Truckee is fishing really well, top to bottom. Mornings have the fish eating right from the start with bugs hatching until early afternoon and then again during the last “magic” hour. Dry dropper rigs fished in fast water and over drop offs, have been taking fish. For dries, try ants, beetles or a big stone with a long dropper of most-any mayfly imitation. Doug O’s “peaches and cream” has been the hot fly lately. The little Truckee is doing what it does best. Sight fishing dries to weary trout. The PMDs are just getting started, and the fish are ready for them. You just have to be in the right place at the right time. Without spooking the fish of course! Take your time when approaching the river. Watch for 5 minutes. You’ll catch more fish. And don’t be the angler parked in 1 hole all day. Fish a section, and then give the next person a shot. The East and West Carson’s are both fishing very good as well but with different techniques. The West is a smaller meadow stream and doesn’t see nearly the run off the the East does. This has been clear and fishable for a moth now. Dry droppers and light nymph rigs will have you hooked up throughout the day. The East Carson is very different. It’s a bigger river that flows through a canyon. The flows have dropped to “fishable” levels and the fish are hungry! It only gets better as the summer goes on. Streamers, heavy nymph rigs under a bobber, and tight lining have been the go-to. Then there are rivers that we never say the name of. They have a special place in our hearts. When the fishing is good here, it’s great. Spring run off has not only effected the local rivers but has had a big impact on how the fish are acting at pyramid. Late winters, colder weather and consistent flow of fresh water from the Truckee have kept water temps down. We are starting to see a lot of the fish in the shallows when the water has a chance to warm up. Cruisers are becoming a common afternoon occurrence. There are a few fish feeding mixed in with the "zombie cruisers". The majority of the fish you will catching will be just out of site but still in shallow water. Afternoons have come around again to be the better bite, thus allowing shallow flats to warm up. As it's looking now this season will have a prolonged productive bite since we are STILL 6-8 degrees colder than a normal year in mid-April. One of the most interesting observations we have had are the look of some of the fish. We are getting pods of milky/pale males and very chrome females. Indicating a lot of fish have not spent a lot of time in the sun and shallows. But rather stated deep and explains why earlier in the year was so tough. But it's on and numbers are coming in. We are having the most consistent number days we have had all year. For this time of year and new water levels, be adaptable to the new conditions, algae growth, new or on existent ledges, and muddy water from high river flows. This is very productive time of year for shore anglers and the flies you need are as followed. For floating line and indicators. Midges and nymphs have been hard to beat. The size varies drastically but body colors include: red, black, wine, brown. Balanced leeches have started to really pull numbers in as well and great colors for these patterns are olive, black, white, brown. Stripping has also been a great way to get into some fish especially in lower light situations. Contrasting colors is a great start. Stripping patterns include popcorn beetles and boobies paired with a wooly bugger, clouser, streamer etc. colors for these are Olive, white, black and chartreuse. I hope these tips help! Keep at it and this is the time of year to see some bent rods! Reward for getting Admin work done !! Epic battle on the 5 wt for sure !! Thank for the NJ Trev ! Goodbye March, Hello April !! I took a water temp today 4/1 at 3:30 this afternoon in 6 ft. of water and we are in the 48-50 degree range. This is 2 to 4 degrees colder than this time last year. The fish are coming within casting range and cruising the shallows for brief periods throughout the day and will continue to stay within casting range once the water warms up a bit more. We have seen a big increase of fish cruising shallow the last couple of days. We might sound like a broken record but it’s actually a good thing the lake is still on the cold side. The water will reach the “peak” temperature in April and this will extend the season for everyone. Over the last week we’ve seen the bite go from a strong morning bite with little action in the afternoon to a slow morning bite and a strong evening afternoon/evening bite. When planning a trip out to Pyramid try and give yourself the opportunity to catch one of the special periods. Usually 2 or 3 days will give you a great shot to at an epic bite and as always more time on the water is always better. Juan and Rob from Colorado were out fishing with us for 5 days and boy did they ever put on a clinic. Example: 3/31 they were quick on the hook set and put 30 fish in the net, nothing smaller than 22 inches. Fish were literally eating midges yesterday off the top of the water. What a sight to experience. Mark, Steve and Ken from Colorado also got into the bite at the beginning of the week. They landed at Reno Airport at 12:09 pm and headed to the lake. By 5pm they put 18 fish in the net out of 36 takes/hits/bobber downs. They had more fun ribbing each other on the missed strikes then fishing. Great to see grown men acting like kids. Amazing how time on Pyramid Lake turns you into a kid. Fishing is all about fun, leave the BS from home or work at home or work, the fish can sense your stress. Was that 6 or 7 wraps guys ? LOL inside joke. Ken was all smiles his entire trip. Steve with Steiner Optics had his sights on Cuttys all day. Mark and Capt Rob enjoying a great day fishing together. A good box of flies this time of year will have midges in a variety of colors including red, wine, black and brown. As for stripping flies, you can’t go wrong with Doug O’s popcorn beetle and black wooly worm. “TIP” When tying your Wooly Worms use 2-4 hackles to create bulk. This will create more water movement. Trust me, it works. Wes, Tony and Shawn from Canada came across the border to fish with Guide Casey Anderson for 2 days. Blue Bird Skies didn't deter these guys from hitting the lake hard. From light takes to double hook ups they encountered all conditions and "Roped" the fish. Edit: 4/1 4pm-530pm Hundreds of fish cruising the shallows and were on the CHEW !! It was WFO for Josh, Kiana and Robert. Give us a call if you have any questions or would like to book a trip. Good luck and we’ll see you out at the lake.